Jive Voice Gateways are not strictly required for Jive Voice to function properly. However, they do add functionality that can improve voice quality, increase network transparency, and allow for limited PSTN survivability. Jive Voice Gateways can be configured as your organization’s gateway router or pass-through device for voice traffic only. Jive Communications handles the initial configuration for these devices, and prefers to maintain access to them for troubleshooting purposes. 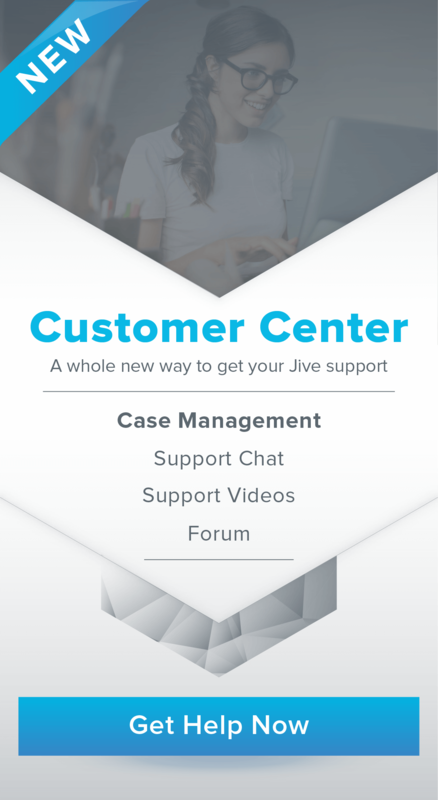 Jive Voice Gateways are premise-based components, configured and purchased through Jive Communications. For optimal results, a static IP assignment is required. On some networks, voice traffic can be routed through a Jive Voice Gateway. In these cases, the Jive Voice Gateway can be configured to provide QoS on voice traffic delivered to the WAN. If you are unsure of the capabilities of your current hardware or are uncertain how QoS is to be configured, allowing Jive to deliver QoS via a voice gateway may be preferred. Jive Voice Gateways allow you to monitor historical and active call quality. You can drill down to specific calls or times periods and see the Mean Opinion Score (MOS), latency, jitter, and packet loss of those calls. Without the transparency a Jive Voice Gateway provides, troubleshooting call quality can be time consuming and difficult. The monitoring provided by a voice gateway decreases troubleshooting costs and speeds issue resolution. In the event of a WAN failure, certain Jive Voice Gateways can be configured to automatically failover and route calls over the PSTN (limited to 911 calls, as the number of analog connections is limited). Once WAN connectivity is restored, calls will again be routed over the WAN. To configure PSTN survivability, the Jive Voice Gateway is placed in transparent proxy mode. For this to work properly, the Jive Voice Gateway must have a public IP address to avoid NAT confusion between it and Jive Cloud.